Results at A level this year were very good, with the proportion of A* and B grades up to 55%, the best for three years. A*-E grades (i.e. all passes) stood at 98%. At GCSE, provisional figures suggest the overall 5 A*-C score is up 1% to 86%, continuing our year-on-year rise, with the figure including English and Maths remaining at a very good 66%. 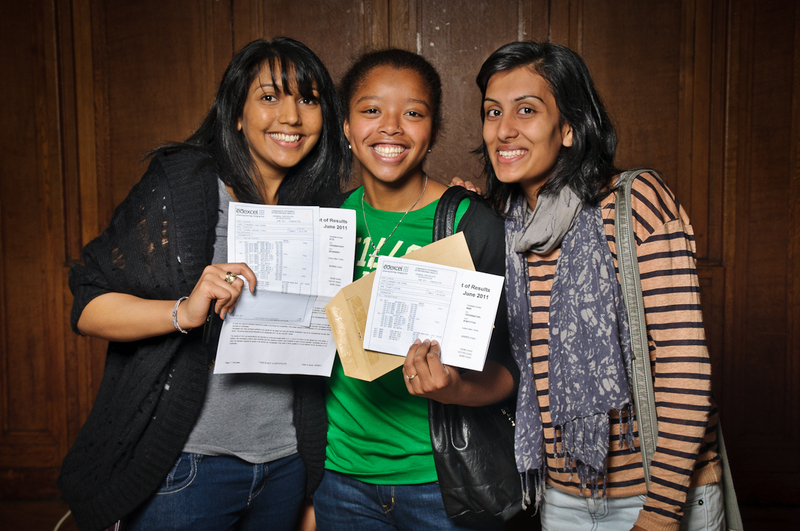 There were many happy faces on the two exam results days as the pictures below show. Kingsbury High School is this week celebrating an excellent set of A level results. 78% of entries gained A*-C grades and 98% of entries gained passes. 55% of entries gained A*, A or B grades. Picture 005- Pritum Hirani, one of the school’s Deputy Head Boys, pictured with teachers David Cumbers and Dan Danaher, achieved AAB and will attend UCL to study Physics with Medical Physics. Picture 008 – Twins Pooja (right) and Priya Khatri (left) achieved A* AAA and A*AAB and are going to the Universities of Bath and Nottingham respectively. Picture 010 – Ranveer Bahra achieved A* BB and will pursue his ambition of becoming an airline pilot in the RAF by taking a place at Buckinghamshire to study Airline and Airport management and continuing his flying training with the RAF cadets. Picture 011 – Basir Kunduzi, pictured with teacher Andrew Mitchell, achieved BBB and will attend Kings College to study Medicine. Basir, from Afghanistan, only joined the school two years ago and was a Deputy Head Boy at the school. Picture 012 – Three outstanding female physicists: Vanisha Hirani (left) with A*AA will study Maths & Physics at UCL, Catrina Nisbett (centre) will take her A*AB to Kings College to study Maths & Physics and Mausmi Juthani (right) with A*AAA will go to Warwick to study Physics. Although not pictured, Head Girl Ferogh Ishan is off to Imperial College to read Chemistry having achieved five full A levels: A*A*AAA.